Two time Oscar winner Asghar Farhadi’s (A SEPARATION, THE PAST) latest and one of his weakest entries shows the Iranian director treading water in familiar territory. The popular saying ‘we have all see it before’ hails true. A SEPARATION and THE PAST, Farhadi’s two best films shows family drama about broken relationships told in the form of a whodunit. The opposite is recognizable in EVERYBODY KNOWS. Who, close to the family planned the kidnapping of the teen daughter? 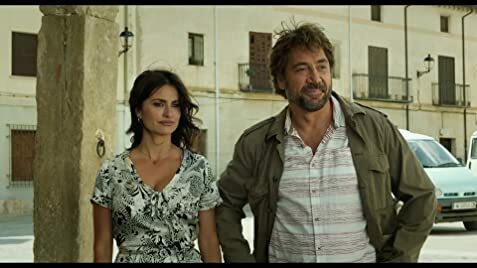 The kidnapping is an excuse for the family drama that unfolds which also reveals a skeleton in the closet for the audience but one that all the characters in the story already know – hence the film title EVERYBODY KNOWS. The film begins with the arrival from Argentina to Spain of Laura (Penelope Cruz) and her two children for her sister’s wedding. During the wedding, there is an electricity blackout during which teen daughter Irene (Carla Camra) is drugged and kidnapped. The rest of the film functions as the whodunit until Irene is finally set free at the end of the film. It turns out that a ransom is to be paid and Paco (Javier Barden), a family friend has the access of funds to pay the ransom. The EVERYBODY KNOWS secret is that Paco and Laura had an affair in the past though Laura is married now to Alejandro (Ricardo Darin) who is conveniently not around so that the two can rekindle their past passions. It also turns out that Irene is Paco’s daughter which serves more incentive for him to get the money to pay off the ransom. There is even more unnecessary drama not entirely related to the plot. Irene is a feisty girl who wants to elope with a handsome local teen. 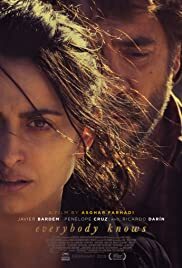 Farhadi has gained the reputation of directing films in a language he cannot speak like Spanish in this Spanish entry or French in THE PAST. This must surely not be an asset though the director has done pretty well in the past. He now appears to glide through films in different countries like a tourist. EVERYBODY KNOWS looks like a tourist ad for Spain with its sunny weather and gorgeous vineyards. The film ends up more a successful family drama and less a satisfying whodunit. The guilty kidnappers are revealed at the end, and they seem to get away with the deed while the poor victimized family continue to suffer. The film opened the Cannes competition in 2018 and has so far received so-so favourable reviews from critics. Can Asghar Farhadi ever make a bad movie? His first UNE SEPARATION won the Oscar for Best Foreign film and his latest THE SALESMAN won the Best Screenplay and Best Actor prizes at Cannes this year. The title comes from the Arthur Miller play DEATH OF A SALESMAN that the protagonist, a high-school teacher is putting up. His wife has just been assaulted in the shower by a stranger and the husband wants revenge. Obviously there is a parallel between the characters in the Miller play and the film. Director Farhadi always injects a dose of suspense in his films, Hitchcock style no matter what the premise of the film is. Like a Hitchcock film, the climax reveals all, and is unexpected. But the prize performance belongs to Babak Karimi who plays the assaulter. Lots of detective work done by the husband to discover the assaulter which should delight Hitchcock fans. But the film contains a few too many unrelated incidents that could have been left out- like the evacuation of the building at the film’s start.